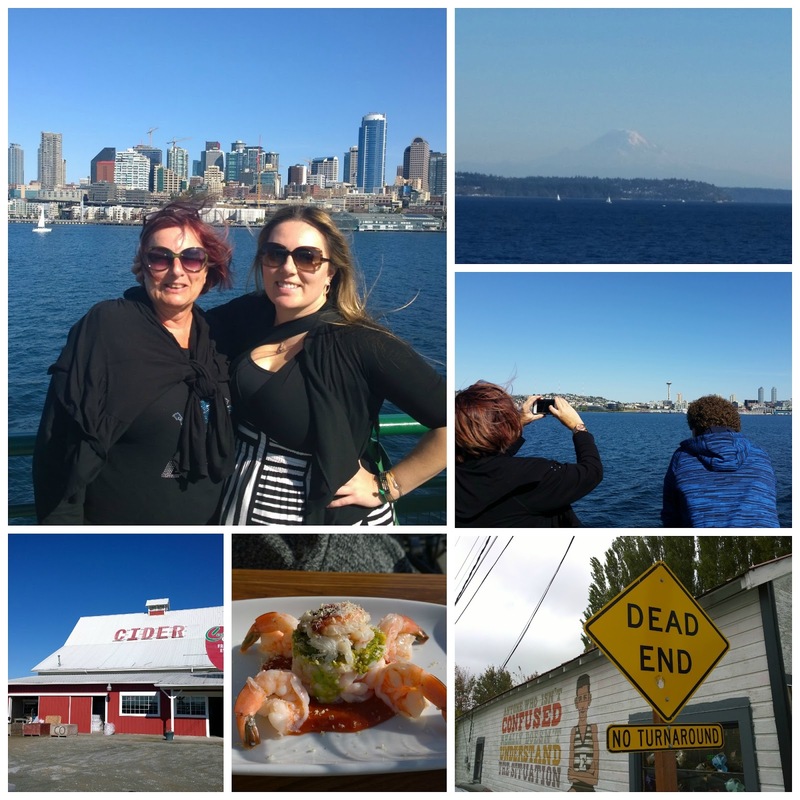 My mom came into town and I wanted to do something different with her – so we decided on heading up to La Conner, WA and Edison, WA to shop, dine, and relax at a bed and breakfast before heading back to enjoy Seattle and Bainbridge. We left Seattle around 10:30 a.m. and first headed past La Conner by a few exits to Chuckanut Drive, headed to Edison, Washington. 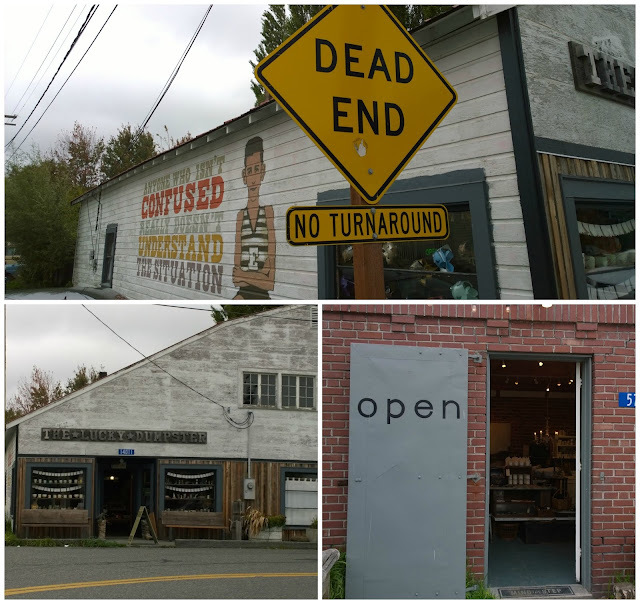 Edison is this tiny town – population 133ish – that is known for being a bit artsy. While small, there are actually quite a few dining and drinking options in Edison. 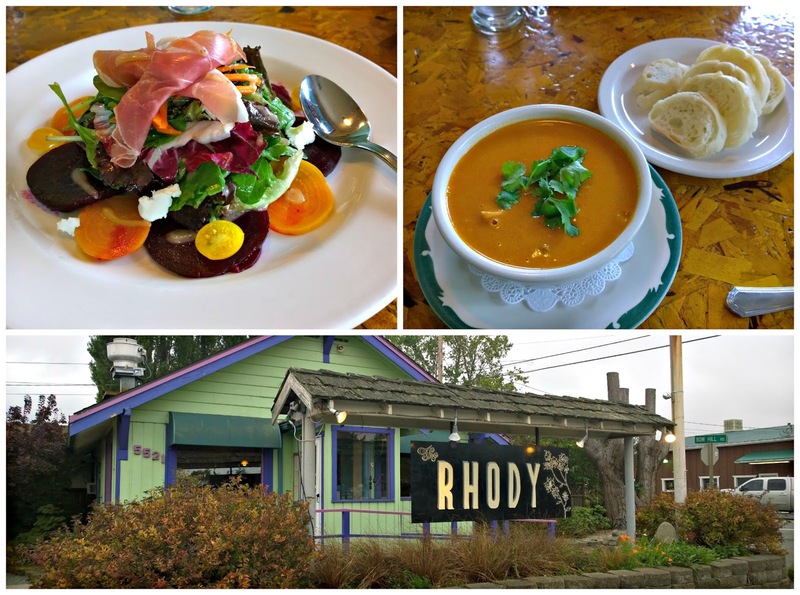 We chose the Rhododendron Cafe, known to the locals as the Rhody. The cafe is in what looks to be a converted house (maybe a farm house?) and has a cozy feel. We sat in the front room, but the seating area was quite big and they even have a screened in porch if you want to be outside and safe from the rain. We arrived about 11:30 a.m. a bit before the lunch crowd to an empty restaurant. After waiting a few minutes, my mom actually went towards the kitchen and let them know we were here. After that, we were sat promptly. The menu was a mix of Northwest and ethnic fare. On special that day was a beet salad (made with local beets), topped with greens, prosciutto, and goat cheese. It was a perfect balance of salt from the cheese and meat and sweet from the beets. We also each ordered the peanut soup, which was a peanut curry soup with chicken and rice. It had a touch of heat to it, and a lot of flavor. Both meals were delicious and I would highly recommend the Rhody. If you have a sweet tooth, they have a bakery next door with huge cinnamon buns, and other yummy pastries. Next we drove into “downtown” Edison and hit the shops. There are about 7-10 or so shops, each with a different type of feel. The most notable shops were the Lucky Dumpster, an eclectic mix of new, vintage, and crafts; Shop Curator, a shop with a lot of random types of art, sculptures, and jewelry that you won’t find anywhere else; and Hedgerow, an upscale boutique with beautiful jewelry, essential oils, perfumes, textiles, and more. Edison is very cute and not too far from Seattle, making it a good day trip. There are a lot of restaurants downtown, including a wine bar and a pub. Another attraction nearby is Taylor Shellfish Farms, where you can buy fresh oysters and shuck them yourself at the picnic tables. The locals also told us that the Edison Bird Festival was not to be missed, as well visiting near Christmas to see the street festively decorated. 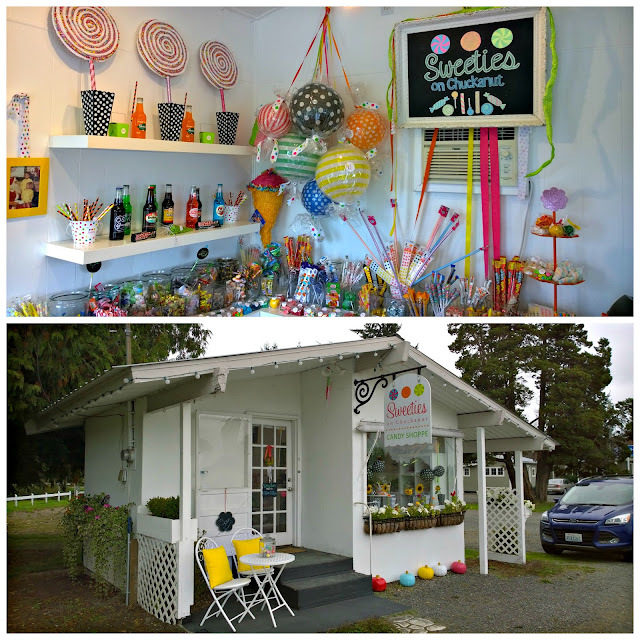 On our way back to I-5 on Chuckanut drive, we stopped by the cutest store ever. Sweeties on Chuckanut is a small stand alone candy shop with a carefully curated selection of candy from your past, and your favorites from now. The prices were very reasonable, too. The shop owner helped me make a cute gift bag full of delicious chewy candies (and the old fashion button candy) to bring back for my boyfriend. We drove south back to La Conner and headed to our bed and breakfast, the Wild Iris Inn. 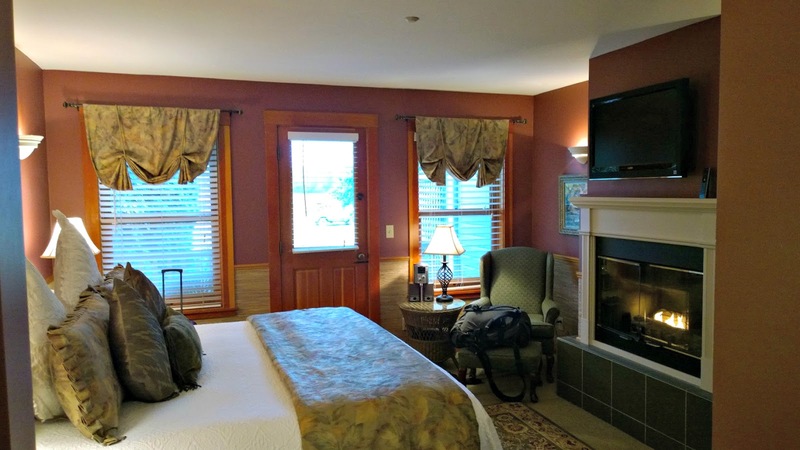 Upon checking in, we were greeted with oversized delicious – sugar with chocolate chip and maybe cherry and who knows what other goodness was packed in – cookies. Our room, room 104, was on the first floor King room and featured a fireplace, flat screen (the B&B has a lot of DVDs to borrow if you’re in the mood for a movie), and sitting area. Also, the B&B uses Aveda soap and shampoo, which is one of my fav hotel soap brands. After we checked in and got settled, we went to First Street to shop. We went into pretty much every shop in La Conner, which is a lot of shops. If you’re looking for home decor, jewelry, kitchen goods, lavender, clothing, etc., you may just find it in La Conner. I will say that we didn’t find anything spectacular that we had to have, per se, but it was fun to browse the shops and spend that time with my mom. After shopping we stopped at the grocery store to pick up champagne and cheese, and then chilled for a little bit before heading to dinner. After looking at the local menus, we decided to try the restaurant recommended by our B&B. The Oyster and Thistle was just an 8 minute walk from the B&B. The upstairs is a traditional sit-down dinner, and downstairs is a bar with a few booths and an outdoor patio. We decided to sit downstairs at the bar, as it was more our style (the full menu is available downstairs, too). I got a scotch to drink and my mom ordered a fancy basil and cucumber cocktail. We both had the French onion soup – which was absolutely delicious and served nice and hot – and we split the salmon. The salmon was also very good, and was served with a side of greens (with an amazing light dressing) and fingerling potatoes. It started drizzling and we walked home in the drizzle and fog. We got back to the hotel at about 9:00 p.m. and decided it was time to check out the outdoor hot tub. It was there, so we might as well use it, right? I filled up the tub and got in, and it was actually huge. We could have fit three people in. 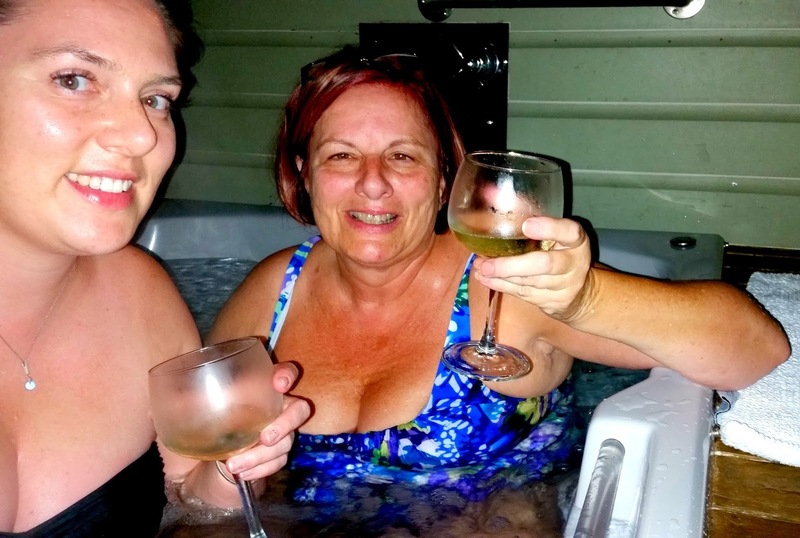 My mom popped open the bottle of champagne and we set up the bubbles and cheese at the edge of the tub. It was a perfect night for outdoor tubbing. We did keep hearing rustling in the bushes, which freaked us out a bit, and every now and then the winds would turn and we’d get a strong whiff of manure from the farm behind the deck. It wasn’t unpleasant, like you would think, it just added to the farm vacation effect. 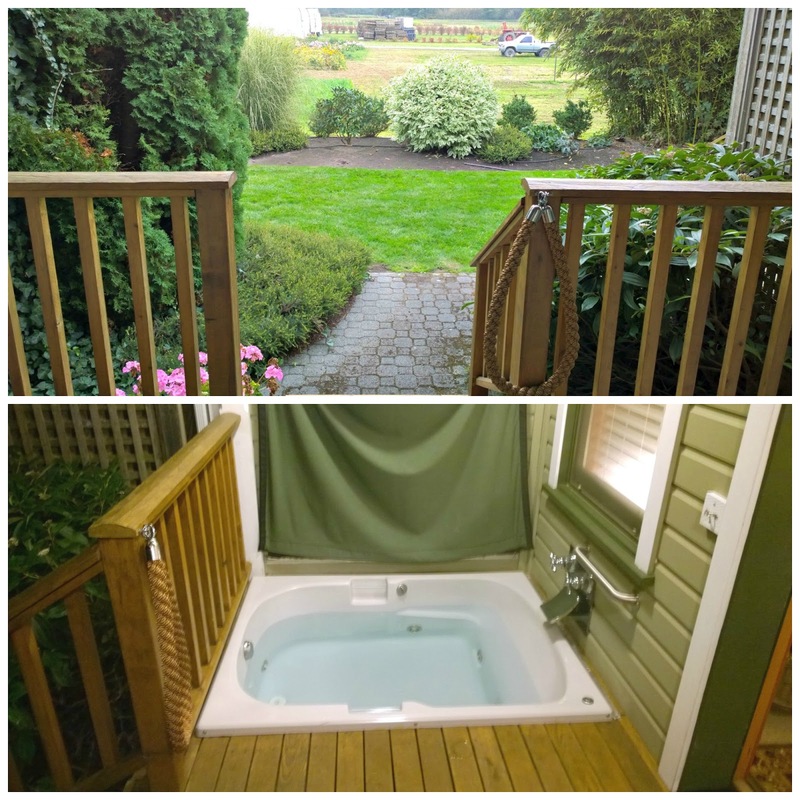 And after the soaking tub, we were exhausted and it was time to go to bed. 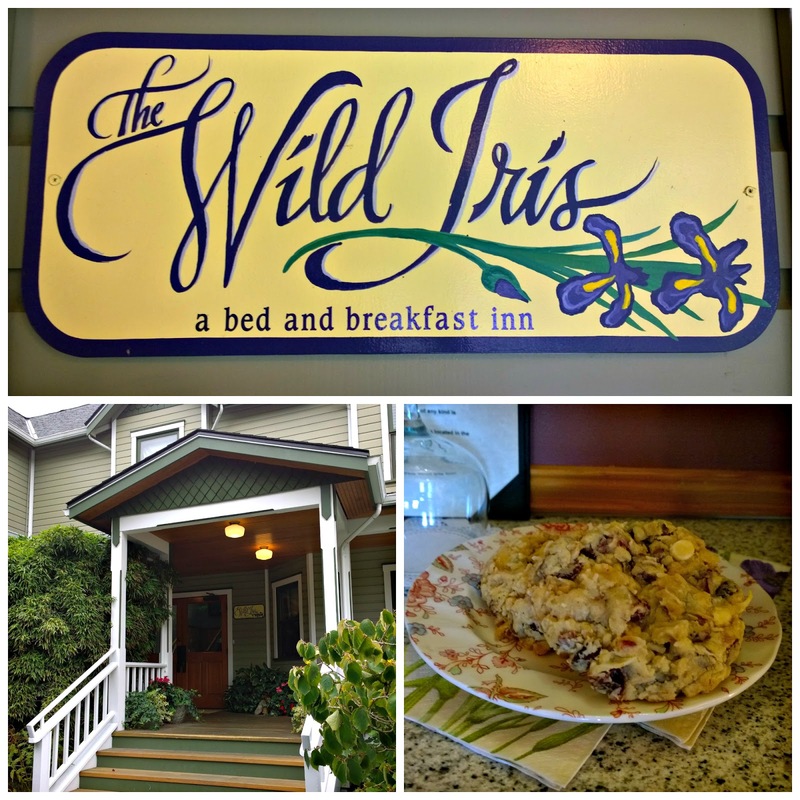 Plus, breakfast is served between 8:00 a.m. and 9:30 a.m. at the Wild Iris, so we had to get up early. The next morning we got up and headed to the breakfast room for the breakfast part of our B&B. I don’t eat mushrooms and mentioned that upon check in and everyone was very accommodating to my picky needs (even though breakfast that day didn’t include mushrooms – thankfully). Our first course was yogurt topped with fresh berries and granola. It was served with a side of homemade bread that tasted maybe of oatmeal and cinnamon? Our second serving was a savory frittata with tomato, Parmesan, greens and a bruschetta sauce (which I had served on the side). 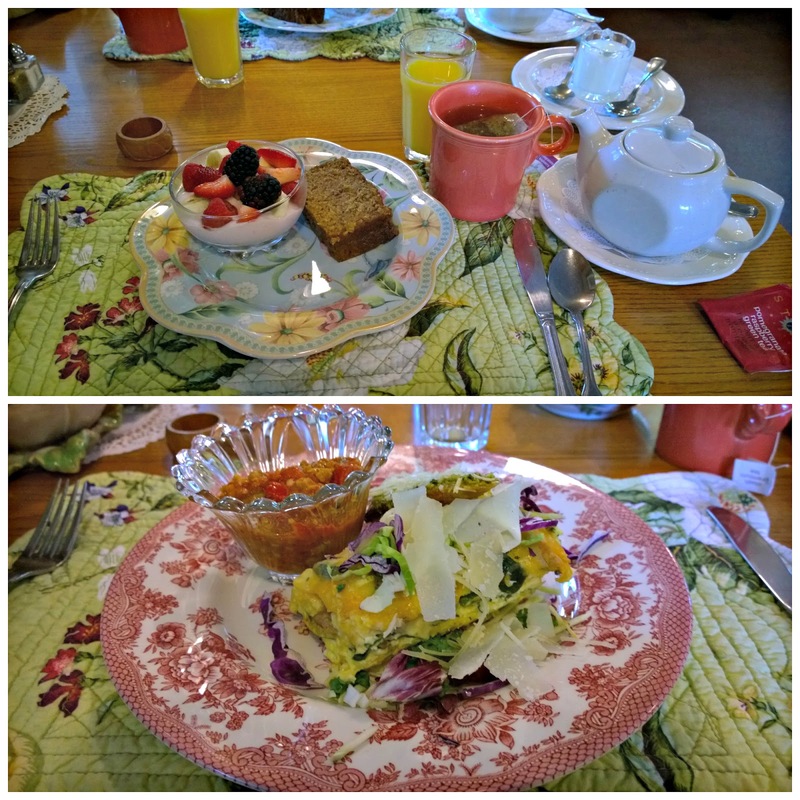 I was quite surprised at how good the breakfast was, and how large the portions were. This was sure tokeep us filled for te day. La Conner has a lot of other great restaurants and cute places to stay. Our restaurant runner-up was Nell Thorn (on the water) and our B&B runner-up was The Heron Inn and Day Spa. And of course in the spring, La Conner is ground zero for the tulip festivals. 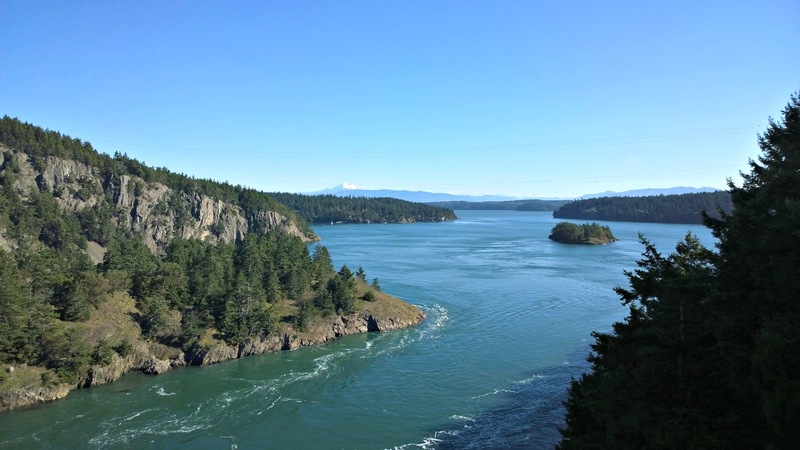 We checked out of the hotel early because our next stop was to explore Deception Pass. It’s about a 20-minute drive to the bridge, and we stopped near the bridge to watch the water swirl and check out the views. This is such a beautiful spot and the weather was cooperating perfectly. 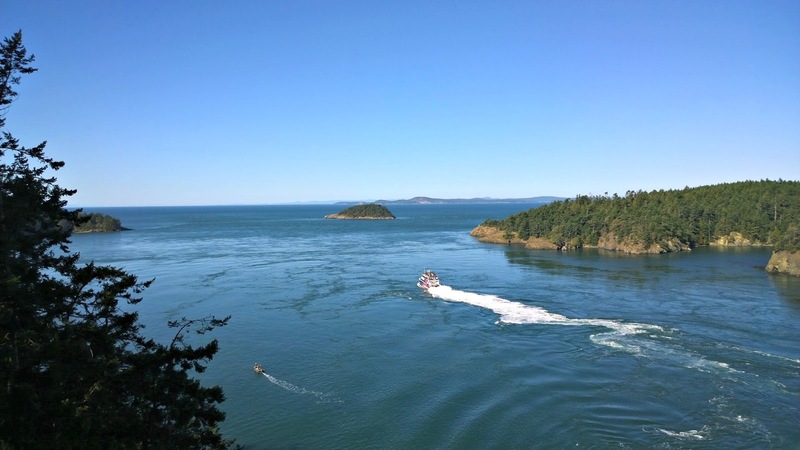 Some fun facts about Deception Pass, it was named by Captain George Vancouver in June of 1792 due to Spaniard explorers mistaking the currents for a river to the east, and thinking it was a bay (they thought Whidbey and Fidalgo Islands were not islands, but peninsulas). 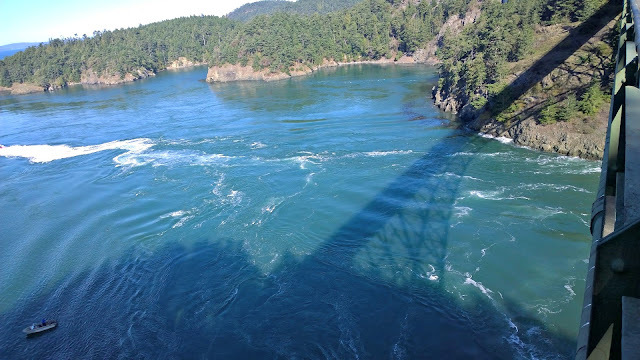 The Deception Pass Bridge was finished at noon on July 31, 1935. 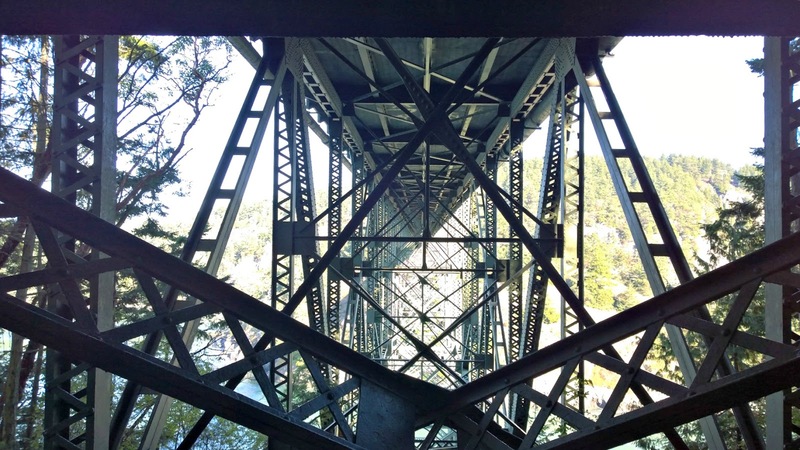 And it actually costs most to repaint the spans in 1983 than it did to build them in the first place. Being the Michiganders that we are, we can’t pass a cider mill. We stopped at Cedardale Orchards in Mount Vernon (at exit 225). You can buy cider there via the honor system, just by putting your cash in a red box. We bought a gallon, which was $6. OK, the cider was good BUT this is NOT a cider mill. 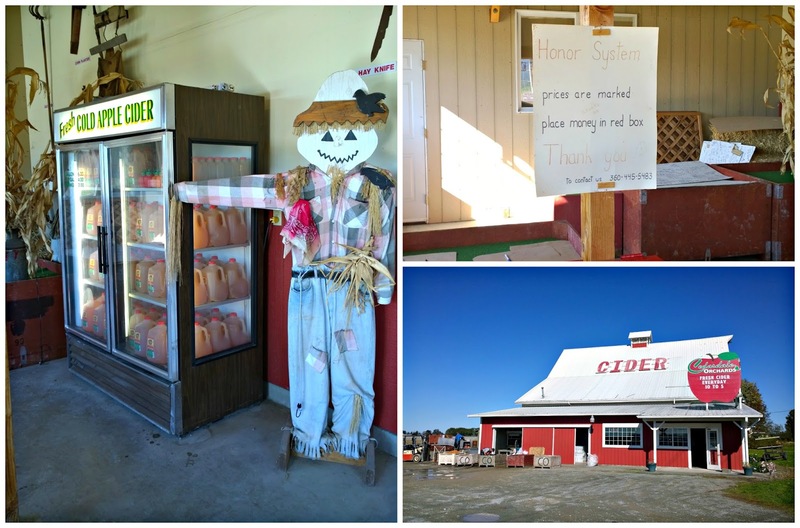 Michigan cider mills have cider (hot, cold, hard, to-go, etc), doughnuts, picnic tables, families, etc. Some have pumpkin patches, or hayrides. My favorite cider mill back home is Parmenters, and if anyone in the Seattle area knows of a cider mill like this – please let me know ASAP. After our mini-vacation up north, my mom and I headed back to Seattle, parked the car in my Belltown garage, and headed out to the Pike Place Market for some souvenirs for my mom to take back, and then to lunch. Since it was such a beautiful day, we wanted to eat on the water. While a bit touristy, we decided on Ivar’s (and I haven’t been there since they had the remodel). And then it was time to eat lunch! We split a Roasted Beet Salad, the Ivar’s Seafood Cocktail, and then each had the chowder sampler. 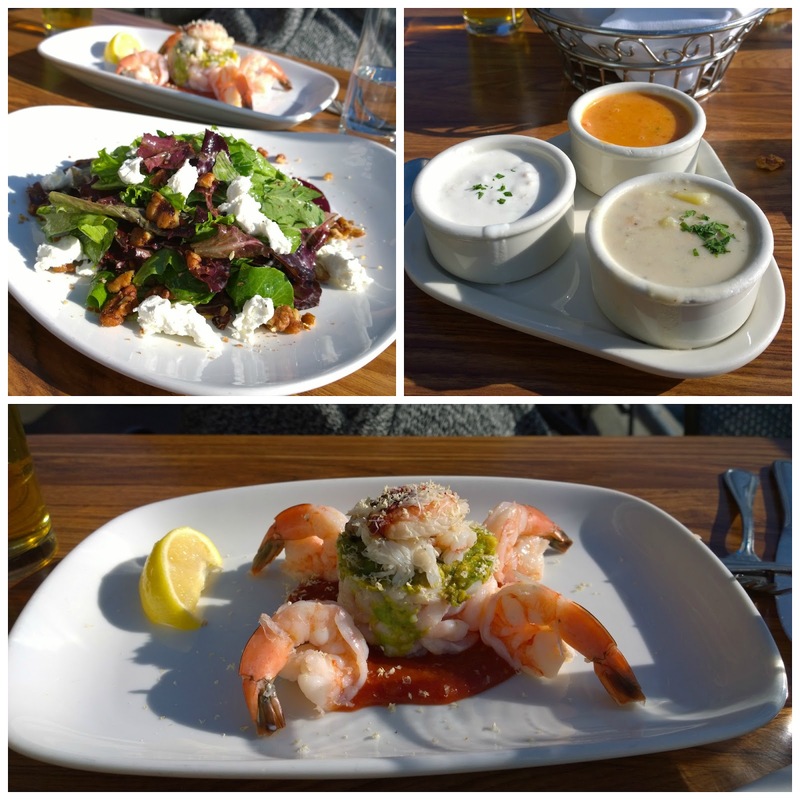 The chowder sampler had Ivar’s Famous Clam Chowder (white), Ivar’s House-Smoked Salmon & Corn Chowder (red), and the NW Seafood Chowder. 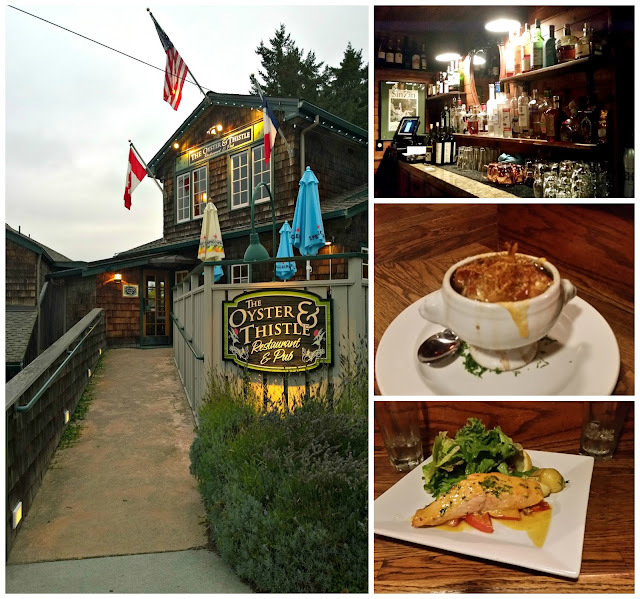 My favorite was the NW Seafood Chowder, by far. The salad and the seafood cocktail were pretty good, too. 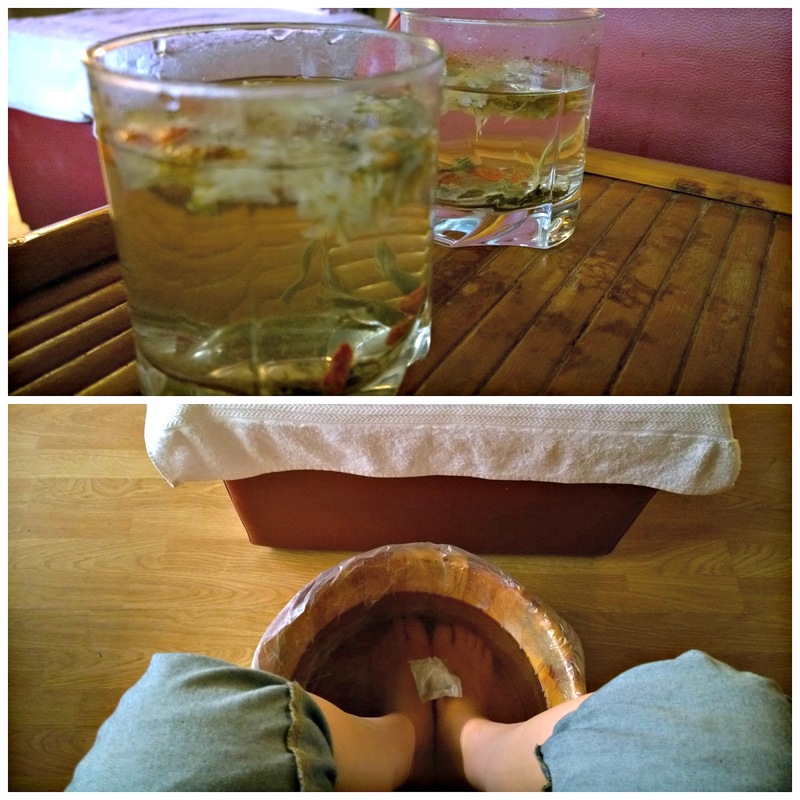 Next we went to the International District to have a foot soak and a foot massage at East West Massage. We called from Ivar’s and made an appointment for 15 minutes later, and headed up there. When we arrived we were the only patrons. It was very quiet and we were seated immediately in large plush chairs. After being covered with a blanket and served tea, we had buckets with fresh water and a bag of herb to soak our feet. The buckets were lined with plastic bags – I was pretty stoked about that, because I felt like everything was super clean. After the 30 minute soak (which they kept adding hot water to keep the temp comfortable), it was time for a 30-minute foot massage. OK, I can’t even describe how wonderful this massage was. I think I fell asleep for a few minutes, I was so relaxed. I need to make a mental note to visit more often, and if you’re visiting – check Groupon, as they often have deals. Upon leaving the spa we went to pick up groceries for dinner that night, and headed back to my apartment. 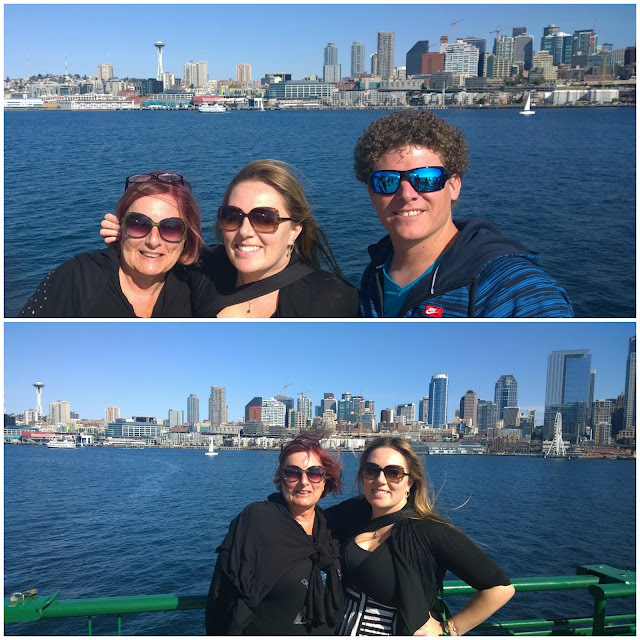 After hitting up Cyclops in Belltown for brunch, we headed to the Ferry Terminal to catch the Puyallup to Bainbridge Island. It was a great day to ride the ferry. 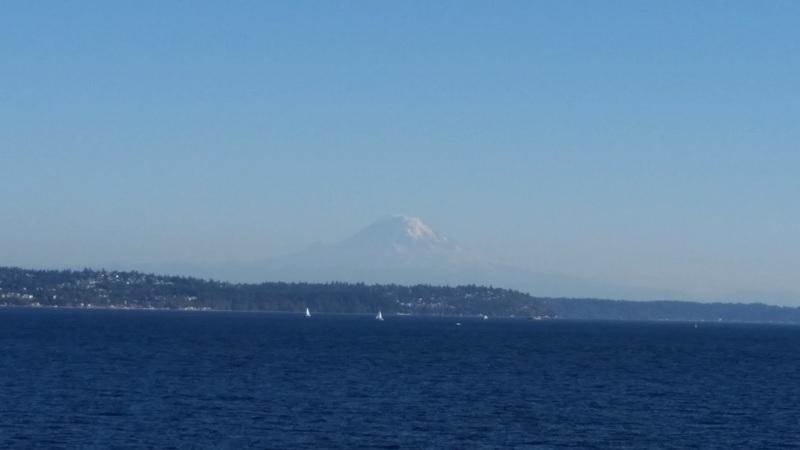 Also, even after living here for eight years, I’m still super giddy when I ride the ferry (and it amazes me that this is an actual daily mode of transportation for many people). 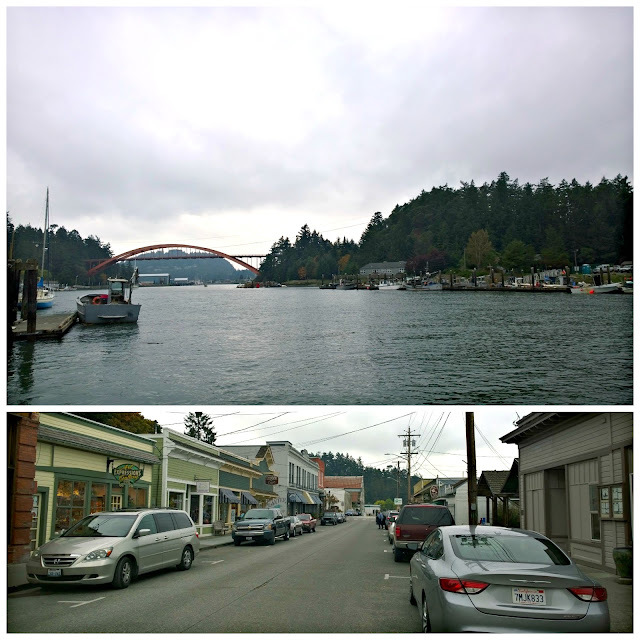 Thirty minutes later we were in Winslow on Bainbridge Island and walking to our first wine-tasting room, Eleven Winery, where we sampled 5 wines for $8. 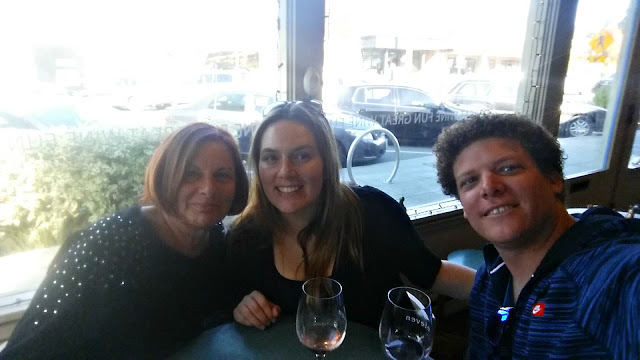 We then went to a few shops (I especially loved Salt House Mercantile and Danger) and then headed to another wine tasting room. Eagle Harbor Wine Company is across the street and serves a tasting menu of five wines for $7. After this stop we were a bit sauced, and needed food. Our plan was to hit Hitchcock, but we realized they didn’t open until 5:00 p.m. We ended up just getting a quick slice at Thatsa Some Pizza by the ferry, before heading back. We went to dinner that night at one of my local favs, Miller’s Guild with some friends, and then a nightcap at Queen City Grill (both not pictured). The next morning I woke up early for work from home (as did Chad) and I let my mom sleep until it was time to make breakfast and send her off to the airport. It was super fun having my mom in town (she lives in Detroit and I miss her a lot) and it is always fun playing tour guide in the city that I’ve adopted, and has adopted me. Hopefully she’ll come back soon… and hopefully she’ll leave comments on this blog with anything that I may have missed (hint, hint, Mom). If you’re a Seattleite hosting your parents, what are your must do and sees? Let me know in the comments below, send me a Tweet, or comment on Facebook.